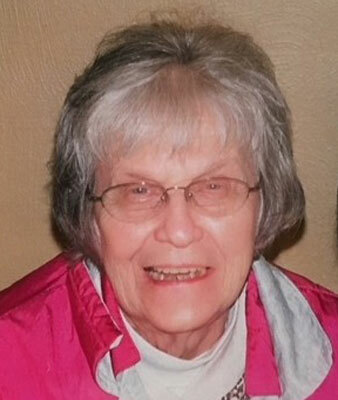 STRUTHERS  Ann Husak Vinkler, 88, passed away peacefully with her family by her side on Sunday, May 13, 2018. She was born Feb. 10, 1930, in Campbell, a daughter of Steve and Mary Subelgak Husak, and was a lifelong area resident. She was a 1948 graduate of Campbell Memorial High School. Ann was devoted to caring for her children and grandchildren, especially by keeping the house stocked with pickles, HoHos, and Fig Newtons, as well as taking frequent trips to Taco Bell. She also enjoyed sitting on her front porch with her neighbors as they watched the kids play. She was a member of Christ Our Savior/St. Nicholas Church in Struthers and loved attending bingo with her sisters, Kay and Mary. Her husband, Robert, whom she married on July 2, 1955, passed away on April 11, 2000. Ann is survived by her daughters, Kathy (Carl) Jones of Boardman, Alice (Ron) Bovo of New Middletown and Deborah Wesley of Las Vegas and two sons, Robert (Michael Readinger) Vinkler of Cleveland and Michael (Susan) Vinkler of Austintown. She will also be dearly missed by her grandchildren, Cheri (Thomas) Metzinger, Samantha, Ronnie (Sarah), and Nikki Bovo, and Justin (Alexa), Jared, Michael, and Tyler Vinkler, as well as one soon-to-be great-grandson. Besides her husband, she was preceded in death by two sisters, Kay Brozman and Mary Calabrette; two brothers, Steve and Michael Husak; three stepbrothers, Andy, Frank and John Sarackman; and two grandchildren, Michael and Elizabeth Vinkler. Friends may call from 9 to 11 a.m. at Christ Our Savior/St. Nicholas Church located at 764 Fifth St., in Struthers on Saturday, May 19. A Mass of Christian Burial will immediately follow at 11 a.m. on Saturday. The family would also like to thank those at Assumption Village who lovingly cared for Nam over the last five years. Please visit www.ClementeFuneralHomes.com to view this obituary and send condolences.